Source: Albania Challenges Khrushchev Revisionism, 1976, pp. 88-101. Before we speak of Liri Belishova, I shall inform the Plenum of some decisions taken by the Political Bureau. In recent weeks we have had correspondence with the Central Committee of the Communist Party of the Soviet Union. We have been informed by the Central Committees of the Communist Parties of the Soviet Union, Bulgaria, Rumania and Czechoslovakia about a letter which each of them has addressed to the Communist Party of China. In essence these letters make serious accusations against the Communist Party of China regarding deviation from Marxism-Leninism, dogmatism, sectarianism, and great-state chauvinism, and other charges like these. At the same time, these letters defend N. S. Khrushchev against what is said in a document which was distributed to the representatives of the communist and workers' parties of the socialist camp by the delegation of the Communist Party of China at the end of the Bucharest Meeting. The material of the Chinese comrades said, among other things, that the Bucharest Meeting was not held in accordance with the proper forms, that N. S. Khrushchev's interjections and actions during the meeting were not Marxist-Leninist, and that these questions which were raised are of great importance to the further development of the international communist movement. Later we received a letter from the Central Committee of the Communist Party of the Soviet Union in which, after stating that the ties between our two parties have been exceptionally close, they say that at the Bucharest Meeting a "spark of misunderstanding" arose between our parties, which must not be allowed to catch fire. Therefore, they proposed to us the holding of a meeting, of whatever level we would like and when we would like, to discuss these misunderstandings together, so that "the Party of Labor of Albania and the Communist Party of the Soviet Union will go with complete unity of views" to the coming November meeting in Moscow. We have sent three letters to the Central Committee of the Communist Party of the Soviet Union. . . .
For the best preparation of the Plenum in regard to the questions we shall discuss, I recommend that the Chinese articles "Long Live Leninism! ", the material distributed by the Soviet representatives at the Bucharest Meeting, the 1957 Moscow Declaration, the copies of the letters we have recently addressed to the CC of the CPSU, of which I spoke above, as well as the materials that have been recommended and not read as yet, should be put at the disposal of the members and candidate members of the Central Committee. All these should be studied carefully so that when we discuss them at the Plenum, the comrades will be prepared. If we receive other materials from the Communist Party of China about its views, these, too, will be made available for study. Let us now get down concretely to the question of Liri Belishova. We gave her the possibility to reflect deeply, to ponder over the grave mistakes she has made in such complicated and difficult situations, to come out with correct conclusions and reveal the causes which impelled her to make these mistakes. At the meeting of the Political Bureau she showed some signs of irritation in connection with the comrades' questions, which served to uncover and make clearer Liri Belishova's wavering on the political and ideological line of our Party. Later, I too summoned her separately, to help her reflect on these questions. Indeed I reminded her of the non-Marxist methods the Soviet leaders had used to disrupt the leaderships of a number of communist and workers' parties; therefore I advised her to think over these questions. I want to say that the Political Bureau of the Central Committee, which is always guided by the principle that things must be explained to comrades to save them from the wrong road and mistakes, had tried to help Liri Belishova patiently and calmly. Her mistakes are not small and trivial , but are profound mistakes, in which, if she does not understand them, there is the danger that they will become even more grave and harmful, both to the Party and to her position in the Party. On the other hand, by criticizing a person who makes mistakes, the Party helps him to arm himself, to make efforts to understand the reasons for his mistakes, so that he no longer falls into such mistakes. This has been the road of the Central Committee, the Political Bureau, and myself, in order to correct those who make mistakes. The Political Bureau thinks that Liri Belishova's mistakes are very great and serious. They show that in fact she is in opposition to the line of our Party, she is not in agreement, not in unity of thought and action on a number of ideological and political questions with the Central Committee of the Party, with our entire Party. She does not understand the vital importance to our Party, as to any Marxist party, of the question of the ideological and political unity in the Party and, all the more so, the question of the unity of the Central Committee and the Political Bureau itself. This question is of vital importance particularly in the existing situation, when the imperialist enemies and the modern revisionists are striving to split the leadership of our Party at all costs, even if they can cause some small cracks, to weaken it and then attack the Party. Therefore, those who damage this steel-like unity, which the Party has forged with struggle and bloodshed through all sorts of storms, must be severely punished, as they deserve, as the great interests of the Party and the people require. What are the mistakes of Liri Belishova? As you know, Liri went to China. This trip had an official character, and the delegation of which she was a member did not include all sorts of people, but Party people. Thus, the delegation did not comprise apolitical people, but known personalities of our Party and State. Before leaving for China, she knew of the disagreements that existed between the Communist Party of the Soviet Union and the Communist Party of China, not to the full extent to which they developed later, but she knew many things. When it was recommended to her, as far as possible, to avoid expressing opinions on these still unresolved problems, this means that she had knowledge of the nature of the disagreements between the Communist Party of the Soviet Union and the Communist Party of China. However, Liri Belishova went to China and did not act as recommended. During her stay in China, Liri Belishova showed a surprising fear and avoided any discussion with the Chinese comrades, when it was a question of expressing the opinion of our Party about modern revisionism, about our friendship with the CP and the Government of China, and about the correct meaning of the ties with the Soviet Union. Indeed, in various ways she asked them, as far as possible, to refrain from discussing party questions because, allegedly, "she was not authorized,"3 etc. Why she did this, we shall see later, but the fact is that the Chinese comrades wanted to discuss party questions with us. We cannot prevent them from talking, but we have our own stand, and this stand must be expressed on every occasion. It is not so simple to seek to avoid talking about party questions. Although Liri Belishova strove at all costs to avoid dealing with party problems in the talks with the Chinese comrades, they considered it reasonable to talk to us about so great and delicate a question. Of course, they did this because they had great trust in, and deep respect for, our Party. Apparently, this is not how Liri Belishova evaluated this question. Instead of maintaining the stand that should have been maintained in these talks with the Chinese comrades, without any instructions to do such a thing, she opposed their views on some questions and gave them to understand that we were leaning toward the Soviet leaders. Not only had our Party not expressed itself in favor of such a stand, but all the comrades of the Political Bureau were in disagreement with many stands of the Soviet leaders about political and ideological problems that were apparent both in their practical activity and in their press. Therefore, our Party had never pronounced itself against China. With her attitude, Liri Belishova implied to the Chinese comrades that our Party did not agree with their views. The other mistake of Liri Belishova's was that she went and made contact with the counsellor of the Soviet Embassy in Peking, and told him about the things the Chinese comrades had said to her. From this her aim emerges very clearly. The Soviet leaders, from Khrushchev down to Polyansky, understood how Liri was thinking, that they were her personal opinions, that she was against the Chinese views and for the Soviet position on these questions. Liri Belishova was considered by them the "heroine" of the situation. The Soviet leaders utilized her actions to create a difficult situation in our Party, in our leadership and among our cadres. After the Bucharest Meeting they got hold of all the comrades who were in the USSR to expound their views4 and to get their opinion, in one way or another, to see if they were with the Central Committee of the PLA. One of these views was that in China Liri Belishova took a "heroic" stand, that "she gave the Chinese comrades the proper reply and did not allow them to issue a communiqué on the talks they held with her." This is what the Soviet leaders are saying. Not only was Liri Belishova predisposed to adopt such a stand, but she made another organizational mistake; she violated the discipline of the Party. She did nothing at all to seek the opinion of the Political Bureau. She did not understand that this was a harmful action to fan the flames in this situation of disagreements which existed between these two parties. She knew that disagreements existed between the Communist Party of the Soviet Union and the Communist Party of China, and not between the Communist Party of China and the whole of international communism, as this matter was put forward at the Bucharest Meeting. We have had sincere relations with the Communist Party of the Soviet Union on everything. But in the way the events developed, and when i t is a matter of a third party being accused, we should not pour oil on the fire. Before she left for China, I talked with Liri Belishova about what Mikoyan had told us concerning the Communist Party of China. I also instructed her not to talk about this question with anyone, as long as we had still not informed even the CC of the Party of these disagreements. Liri Belishova should have understood that since we had not informed our Party, it was not up to us to inform the Communist Party of China of what Mikoyan had said about them. Not only was Liri Belishova instructed, but even if she had no instruction at all, as a member of the Political Bureau she should have realized that the questions raised with her by the Chinese comrades could not be discussed with a third party without obtaining the approval of the Central Committee. Why did Liri Belishova not seek the opinion of the leadership of the Party? Because she did not have a correct concept of the leadership, of the Political Bureau. She has been conceited and has overrated her own abilities and intelligence, otherwise, like any other member of the Central Committee, when difficulties are encountered about an important problem, she should consult the leadership of the Party and not act without receiving its advice. Liri Belishova did not do this because she liked the position she held. At the Political Bureau she tried hard to justify her mistakes in Peking. She clung to such arguments as that she was alone and had nobody to consult. But the fact is that she continued to make mistakes in Moscow, too — indeed up to the meeting of the Political Bureau after she returned. She does not want to understand her grave mistakes, and she does not admit them. When Liri Belishova was in Peking I sent her a radiogram. What was its content? When the holding of the Bucharest Meeting in June was preposed to us, we had received a radiogram from our embassy in Peking, by which we were briefly informed of what had happened at the meeting of the Council of the World Federation of Trade Unions, about the major differences of principle between the delegations of the Soviet Union and China. We knew that Liri Belishova would have meetings with the Chinese comrades, so we sent a radiogram concerning the meeting of the communist and workers' parties which was expected to be held in June. We told her that Chinese comrades had proposed the postponement of the June meeting, and if the Communist Party of the Soviet Union and the other parties agreed with their proposal, we had no objection. If it was to be held in June, we said in the radiogram, the Chinese comrades should be informed, if they would allow us to express our modest opinion, that the participation of the great Communist Party of China in this meeting was essential. During this time we received another letter from the Communist Party of the Soviet Union , informing us of the postponement of the meeting which was to have been held in June. Then we sent another radiogram to Liri Belishova in which we said that it was not necessary to transmit to the Chinese comrades the content of the first radiogram, because our fear that the Chinese comrades would not come to the meeting they wanted postponed, had disappeared. Liri Belishova read and interpreted the radiogram in the way she wanted and according to the plan she was turning over in her mind. Likewise, we instructed her to find the opportunity to inform the Chinese comrades that we had read and liked the articles published by them on the occasion of the 90th anniversary of Lenin's birth. Liri Belishova did not carry out this instruction from the Political Bureau, because she had her own views. But irrespective of the fact that these articles were not to her liking, she should have transmitted the view of the Political Bureau of the Central Committee of our Party to the Chinese comrades. When she returned, she could have expressed her personal view to the Political Bureau. This shows that Liri Belishova had gone to China with definite opinions that were at variance with those of the comrades of the Political Bureau, who at that time held frequent discussions on the political and ideological stands of the CPSU and the CP of China. When she reached Moscow, Liri Belishova was more completely armed. Yo u know that we sent her two simple but very clear letters, fully sufficient weapons for her to avoid making mistakes.5 Taking into account her attitude in China, and especially the shortcomings in her character, such as conceit and ambition, plus the flattery of her by the Soviet leadership who had called her a "heroine," we feared for what she might do and we took this measure so that she could not fall into errors again. Thus, we sent these two letters in order to save her. However, she did not carry out the instructions sent to her. In the first letter, which she received as soon as she arrived in Ulan-Bator, the Political Bureau pointed out to her that she had made grave mistakes in China, and for this reason she should take care not to let the flattery and high-sounding praise that she might receive from the Soviet leaders go to her head. In the second letter, which she received as soon as she landed in Moscow, she was informed of the holding of the Bucharest Meeting, the stand adopted there by our Party, and it was stressed to her that this stand did not please the Soviet leaders, therefore she should be careful to defend the line of the Party, to stress that she fully agreed with the stand of the Central Committee of the Party, as expressed in Bucharest by Comrade Hysni. This stand would have been correct and would have barred the way to all efforts by anyone who might try to split our leadership. Thus, Liri Belishova had been forewarned so as to avoid any mistakes, had she agreed with the line of the Central Committee. But the fact is that this is not what happened. We know the tactics pursued by the Soviet leaders. They invited Liri Belishova to lunch, but there she did not maintain the stand on which she had been instructed by the Political Bureau. She used there the tactics of jokes. "We must make jokes, " she thought," to get out of this situation," but in fact jokes did not help her, and a situation was created that was favorable to the Soviet leaders, unfavorable and in opposition to the stand of the Central Committee of our Party, and compatible, in the final analysis, with the views of Liri Belishova. During the lunch the Soviet leaders began with praises and toasts to Liri Belishova, and with attacks on our Party, but Liri Belishova dodged the touchy issues, the blows and venom against our Party, directed particularly by Kozlov. Kozlov expressed his dissatisfaction over the stand of Comrade Hysni [Kapo] in Bucharest, and she did not knock him back immediately. She pretends not to be clear about this question, but she allegedly told Kozlov that "Enver Hoxha has no skeleton in the closet like Gomulka" who they said had adopted a pravilno, yasno [correct, clear (Russian)] stand. She should have intervened immediately to say that at Bucharest our Party adopted a correct and clear stand, and that she agreed with that stand. Then Kozlov said, "We want friendship, but without zig-zags." But who is developing friendship with zigzags? Liri Belishova did not give the proper reply to this, either. In the letter we said to her that Khrushchev did not like the stand of our Party at the Bucharest Meeting; therefore she should have understood that when there was talk of zigzags it was our Party that was being attacked, and she should have replied that our Party does not make zigzags. Thus, such a stand of Liri Belishova's is deliberate. During the lunch other insinuations were made, such as: "Whom are you Albanians with — with the 200 or the 600 million?" But this, too, went without a proper reply from Liri Belishova. At the meeting I had with Ivanov, I told him that what Kozlov said was anti-Marxist. And what did he mean by "with the 200 or the 600 million?" Our Party was on a Marxist road, therefore it was with all the countries of our socialist camp. However, at the Plenum Liri Belishova told us that she did not hear this question properly, or did not understand it. But it is impossible that this escaped her ears, for he said it at lunch, sitting near her, and we do not agree with such a justification. They might even have said these things in a confusing, indirect way, but at the end of the lunch she should have risen and said: "Comrades, there are no zigzags in our line. We are for the unity of all the countries of our camp; therefore let us drink this toast to the triumph of Marxism-Leninism!" But in fact this was not the way she acted; the lunch and these venom-filled remarks of the Soviet leaders were passed off with a laugh. But why with a laugh? Because Liri Belishova did not agree with the line of our Party on these questions, she had a different view and she thought that her view was correct and, in the final account, in her opinion, the views of the leadership of our Party were not correct, and that in this situation we were making mistakes. Thus, even when she came back, Liri Belishova showed some signs and took some actions which confirm this. She began especially to say to the comrades: "Comrade Enver should be sidetracked, we should not draw him into this situation so that he will not compromise himself over these questions." In plain language, according to her view, this means, "Nobody knows how the conflict between the Communist Party of China and the Communist Party of the Soviet Union will end. Therefore, we should leave Comrade Enver out of it, not let him meddle in it, and when this problem is over, then we shall see who is right, you or I. That's the time for Comrade Enver to come out and give the stick to the others who were wrong, and in this way we are in order." That is, even after her return to Tirana, in spite of the advice given her at the meeting of the Political Bureau, Liri Belishova continued to maintain the same stand and to concoct intrigues to disrupt the leadership of the Party. Linked with this is also Liri Belishova's other thesis: "We must prepare several variants for the Moscow Meeting" and, after we see which way the "wind" is blowing, make use of the one that seems to us the most advantageous. This is a very wrong, opportunist view, entirely unacceptable to our Party of Labor. We must go to the Moscow meeting, not with "several variants" but with a clear-cut stand, not with ten banners but with one, the banner of Marxism-Leninism. Another view of Liri Belishova's was that the comrades of the Plenum or the alternate members of the Political Bureau should not be given the documents exchanged between the Political Bureau and Comrade Hysni Kapo in Bucharest, who was instructed through them about the stand he should adopt there. What does this mean? This is connected with the fact that "these documents bear Enver's signature, therefore we should not expose him." Why should we not inform the Central Committee about the practice followed by the Political Bureau, and let the Plenum judge its work? What is wrong with this? But in reality there are, and there should have been, second thoughts in Liri Belishova's head. The explanations she has given have not convinced the Political Bureau that she has thoroughly and profoundly understood her mistakes. She should bring out the reasons why she acted as she did and who impelled her, from what bases these thoughts arose in her — that is, she should make a profound analysis of her mistakes. That is why we analyzed this question again in the Political Bureau. The aim of this discussion in the Political Bureau was to help Liri Belishova. The contributions to the discussion were heated, severe, for they concerned the defense of the interests of the Party, its line, its life. We must stand firm in behalf of the interests of the Party. To tell the truth, Liri Belishova was given plenty of help by the comrades, and she should have made a frank self-criticism, with the gloves off. But her self-criticism in the Political Bureau was not satisfactory. She said nothing; indeed, through her contributions she indirectly expressed dissatisfaction and doubts about the stand adopted in her regard. Liri Belishova presented her mistakes in a very simple way. She did not make a Marxist-Leninist analysis of these mistakes, of their sources — something which was expected from her. She did not proceed from the principle of telling the Party the real causes that impelled her to make mistakes, but she clung to such arguments as "she was alone and had nobody to consult." This tactic of Liri Belishova's is not healthy. She should have told the Political Bureau frankly why these mistakes were made and where they had their source. The comrades of the Political Bureau analyzed Liri Belishova's mistakes and arrived at the conclusion that such mistakes would not have been made so easily, had she not had some distorted views about the others and an overestimation of herself. Liri Belishova should have understood clearly that revisionism does not exist only in Yugoslavia, but that revisionist views also exist in parties of other countries, which are deviating from the correct Marxist-Leninist road. Many times we have discussed with Liri Belishova that many actions of the Soviet leaders are not on the right road, but are on an opportunist road, which is to the advantage of the revisionists, particularly of the Yugoslav revisionists. And this has not been a matter only of tactical stands on their part. We observe that the Soviet leaders have allowed the struggle against the Yugoslav revisionists to die down. From time to time they write theoretical articles against the Yugoslav revisionists, but even those have many gaps in them; while as to the concrete struggle against them, this they have cut right out. Indeed there are parties, such as the Communist Party of Bulgaria, which have even taken decisions not to say anything against the Yugoslav revisionists. We cannot say that these matters were a bolt from the blue to Liri Belishova, and therefore she has no right to say: "How could I imagine that in the line of the Soviet leaders there are such revisionist views?" We talk about such problems every day, but Liri Belishova's eyes have been blinded by the flattery and great praise of the Soviet leaders, and she has reconciled herself with them. She has forgotten that on such an important question as that of the disagreements between the CPSU and the CP of China no Marxist party whatever can be hindered from expressing its viewpoint, just as it cannot be hindered from expressing it also on the actions of Khrushchev or Kozlov, which we think are not correct at all. When we speak of love for the USSR, we must not include here those who make mistakes, whoever they may be — Soviets, Czechs, Bulgarians or Albanians. Every Marxist and leader must clearly understand that we do not love the USSR for the beautiful eyes of Ivanov. He [Ivanov] does not love the Soviet Union, or our friendship with the Soviet Union, as long as he acts in a hostile way against a people and a party who nurture a sincere love for the Soviet people, which he has seen with his own eyes during his three-year stay in our country. And why should we keep Ivanov happy to avoid ruining our friendship? The same goes for Kozlov, Khrushchev, and others. We have our own views, which we have expressed and will express. But Liri Belishova was not reconciled to this stand, for she has wavered in the party line. She has been led to these positions by her conceit, she has become very swell-headed, she overrates her own capacities and underrates others. For this she has been criticized several times. In spite of the advice given her, she adopts a very arrogant attitude toward the cadres, she has offended them and continues to do so, she has attacked them so severely that even in the apparatus of the Central Committee there are comrades who have asked to leave for this reason. Despite the criticism made of her, she demonstrated her arrogance toward the cadres even at the last meeting of the Central Committee of the ALYU [Albanian Labor Youth Union]. She acted in the same way also at the Teachers' Conference. To act in this way after all the criticism made of you, means that you fail to reflect on your mistakes. These manifestations show that when you have such scorn for the cadres subordinate to you , you will also have a similar concept of those with whom you are on a par. As a matter of fact, even with regard to comrades of the Political Bureau, Liri Belishova often has not taken a correct and healthy stand. To underrate the comrades of the leadership, and to display this on many occasions even in public, is impermissible. The criticism made of the cadres before the masses is one thing; we have done this and shall continue to do it. But despising and discrediting the cadres is another thing. There are many facts of this nature about Liri Belishova. Therefore, when you have such a concept of the cadres, in complicated situations you make mistakes, as she did, even making mistakes in regard to the line. When you have such views about the cadres up to the leadership, of course you will not have sound views about the decisions this leadership adopts either, decisions that are a many-sided concretization of the political line of the Party. Therefore, if you go on with such rubbish in your head, if you live with this overestimation of yourself, you are sure to make mistakes in the political line, too. Thus, Liri Belishova has been wrong on these questions, and still has not understood her grave mistakes. The Political Bureau came to the conclusion that Liri Belishova should reflect further on her mistakes. We remained dissatisfied with her self-criticism; she promised us that she would think it over, and she must have done so. Now it depends on the self criticism she will make before the Plenum, and on how much she has benefited from the help of the Political Bureau. Her case now depends on the evaluation she will make of these problems before the Plenum of the Central Committee. We advise her to look straight and deeply into her mistakes from a sound Marxist-Leninist basis, for there is no comrade who holds any ill-will, not only toward Liri Belishova but toward anyone at all who has made mistakes. We only wish her well; that is why we are trying to correct her. But with these views she cannot be in the Political Bureau, for it is a very serious thing to be in disagreement with the line of the Central Committee. The Political Bureau has decided to propose to the Plenum that Liri Belishova be discharged from her function as a member of the Political Bureau and Secretary of the Central Committee for Propaganda6, because these high bodies of the Party must not include comrades who run counter to the views and ideological and political line of the Central Committee. In the Political Bureau and Central Committee there must be complete unity of thought and action, and in the first place on the main questions, such as the current question, which is of exceptional importance to the building of socialism in our country and to international communism. 1. These letters are published in this volume [Albania Challenges Khrushchev Revisionism – Ed.] on pages: 70, 80, 85, respectively. 2. On September 3 the Political Bureau distributed a document to all members of the Plenum dealing with Liri Belishova's mistakes and with the stand she had adopted in the Political Bureau. 3. This was a false justification of Liri Belishova's. Not only did she have the necessary instructions from the Political Bureau of the CC of the PLA concerning the stand she should adopt in the PRC, but also through a special radiogram of June 4, 1960, Comrade Enver Hoxha drew her attention and instructed her: "We are reading your greetings in newspapers, and they astonish us. They are extremely dry and contain mistakes. "First all you must speak longer and exceptionally warmly of China: sternly expose the imperialists and the Yugoslav revisionists. . . . It is entirely impermissible to speak of a certain modern revisionism. The successes of our country and the correct policy of the Party in every field must be pointed out well and at length everywhere. The speeches must be politically and ideologically elevated and not with banal phrases. . . . Tear up the hackneyed greetings and speeches you have prepared, and formulate entirely new ones." While the other radiogram of June 6 said: "Talks with the Chinese comrades on the ideological questions under discussion may be held only by you." (Taken from the copies of the originals of the radiograms which are in the Central Archives of the Party). 4. 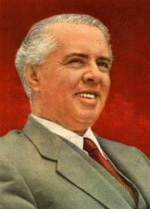 On June 6, 1960, Comrade Enver Hoxha, in a "very urgent" radiogram sent to Liri Belishova, instructed her: "Concerning the Chinese articles on Leninism, you should find the opportunity to say to them that the CC of the PL A finds them very good, and there is no reason why you should not declare yourself in support of them. Continue to put forward the view of our Party everywhere and in all aspects." (Take n from the original copy in the Central Archives of the Party). 5. When she returned to Albania, Liri Belishova was asked by the Political Bureau and the basic organization of which she was a member to hand these letters in. She said that she had allegedly destroyed them. In fact she handed them over to the Soviet leaders during the meetings she had with them. 6. Despite the great efforts of the Political Bureau and the Plenum of the CC to put Liri Belishova back on the correct Marxist-Leninist line, because she was completely compromise d by the Khrushchevite revisionists, she lacked the courage to tell the Party everything, and sticking to the instructions of her bosses in Moscow, she continued stubbornly to maintain an anti-Marxist, anti-Party, hostile stand. Therefore the Plenum unanimously expelled her from its ranks. Later, seeing that she was continuing to maintain an anti-Marxist, hostile stand toward the general views of the PL A and Marxism-Leninism, the Party branch in which she took part expelled her from the Party, too.